On the first anniversary of 9/11, with the attacks still fresh in the minds of many Americans, Slate shared the story of a retired Marine who responded to the attacks on the World Trade Center and found two survivors. In honor of the anniversary, the article is reprinted below. Only 12 survivors were pulled from the rubble of the World Trade Center after the towers fell on Sept. 11, 2001, despite intense rescue efforts. Two of the last three to be located and saved were Port Authority police officers. They were not discovered by a heroic firefighter, or a rescue worker, or a cop. They were discovered by Dave Karnes. His plan worked. With the top off, the cops could see his pressed fatigues, his neatly cropped hair, and his gear up front. They waved him past the barricades. He arrived at the site—“the pile”—at about 5:30. Building 7 of the World Trade Center, a 47-story office structure adjacent to the fallen twin towers, had just dramatically collapsed. Rescue workers had been ordered off the pile—it was too unsafe to let them continue. Flames were bursting from a number of buildings, and the whole site was considered unstable. 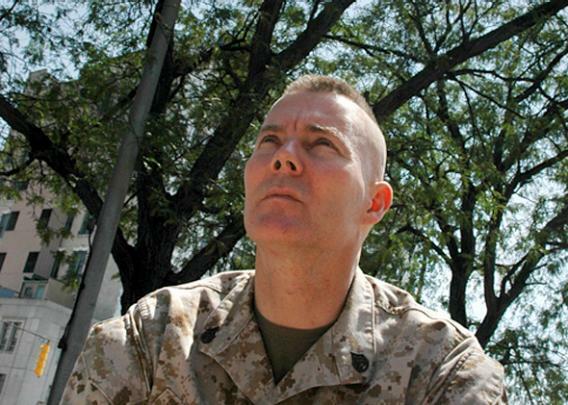 Standing on the edge of the burning pile, Karnes spotted … another Marine dressed in camouflage. His name was Sgt. Thomas. Karnes never learned his first name, and he’s never come forward in the time since. “Don’t leave us,” Jimeno pleaded. He later said he feared Karnes’ voice would trail away, as had that of another potential rescuer hours earlier. It was now about 7 p.m. and Jimeno and McLoughlin had been trapped for roughly nine hours. Karnes stayed with them, talking to them until help arrived, in the form of Chuck Sereika, a former paramedic with an expired license who put pulled his old uniform out of his closet and came to the site. Ten minutes later, Scott Strauss and Paddy McGee, officers with the elite Emergency Service Unit of the NYPD, also arrived. Today, Dave Karnes will be speaking at the Maranatha Bible Baptist Church in Wilkinsburg, Pa., near where he grew up. He sounds excited, over the phone, talking about the upcoming ceremony. Karnes is a hero, too.